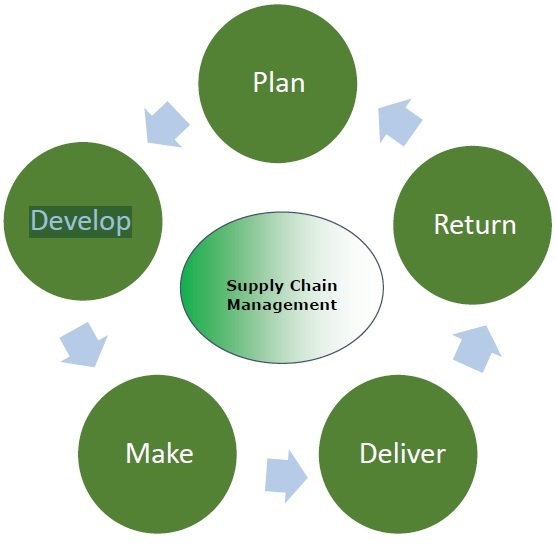 The initial stage of the supply chain process is the planning stage. We need to develop a plan or strategy in order to address how the products and services will satisfy the demands and necessities of the customers. In this stage, the planning should mainly focus on designing a strategy that yields maximum profit. For managing all the resources required for designing products and providing services, a strategy has to be designed by the companies. Supply chain management mainly focuses on planning and developing a set of metrics. After planning, the next step involves developing or sourcing. In this stage, we mainly concentrate on building a strong relationship with suppliers of the raw materials required for production. This involves not only identifying dependable suppliers but also determining different planning methods for shipping, delivery, and payment of the product. Companies need to select suppliers to deliver the items and services they require to develop their product. So in this stage, the supply chain managers need to construct a set of pricing, delivery and payment processes with suppliers and also create the metrics for controlling and improving the relationships. Finally, the supply chain managers can combine all these processes for handling their goods and services inventory. This handling comprises receiving and examining shipments, transferring them to the manufacturing facilities and authorizing supplier payments. The third step in the supply chain management process is the manufacturing or making of products that were demanded by the customer. In this stage, the products are designed, produced, tested, packaged, and synchronized for delivery. Here, the task of the supply chain manager is to schedule all the activities required for manufacturing, testing, packaging and preparation for delivery. This stage is considered as the most metric-intensive unit of the supply chain, where firms can gauge the quality levels, production output and worker productivity. The fourth stage is the delivery stage. Here the products are delivered to the customer at the destined location by the supplier. This stage is basically the logistics phase, where customer orders are accepted and delivery of the goods is planned. The delivery stage is often referred as logistics, where firms collaborate for the receipt of orders from customers, establish a network of warehouses, pick carriers to deliver products to customers and set up an invoicing system to receive payments. The last and final stage of supply chain management is referred as the return. In the stage, defective or damaged goods are returned to the supplier by the customer. Here, the companies need to deal with customer queries and respond to their complaints etc. This stage often tends to be a problematic section of the supply chain for many companies. The planners of supply chain need to discover a responsive and flexible network for accepting damaged, defective and extra products back from their customers and facilitating the return process for customers who have issues with delivered products.